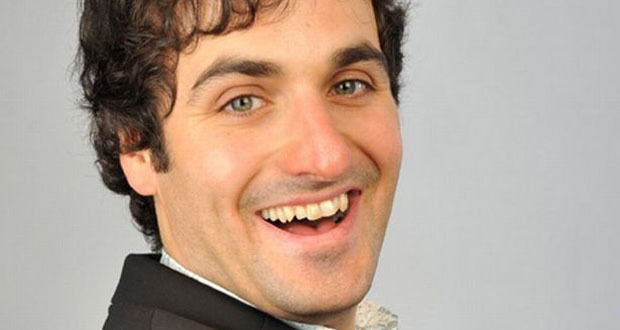 It’s impossible not to like Patrick Monahan. The lively, witty Irish/Iranian/Teesside comic is so friendly that his entire set feels a bit like it’s taking place in his living room over a pint of Newcastle Brown Ale and some traditional Persian snacks. He hugs the audience on his way up to the stage and spends so long chatting to an American family that it’s a wonder they don’t adopt him at the end of the performance. In fact, Monahan is so exuberant and likeable that it almost doesn’t matter that his show doesn’t have very solid foundations. After twenty minutes of audience banter – largely involving the aforementioned American family- you realise that this isn’t a warm up section to get the crowd on side: it’s the entire act. There really isn’t any kind of unified theme at all, just disjointed riffs on a range of topics, energetic dance routines, gentle fun poking and a lot of audience participation. Unfortunately, this lack of material does mean that the show is entirely dependent on how willing various audience members are to play along, and although the American dad tries his best, other people are less chatty. In fact, some of the people to the right of the stage look slightly terrified of Monahan and won’t engage with him at all, so the show does suffer from quite a few dips in energy at times. Thankfully, that’s where his overabundance of enthusiasm takes over. Monahan has got enough for everyone in the room, and then some. He fills the dips with a series of entertaining sections where he attempts to blag his way into a fictional house party by a) giving a fake name and b) entering into a dance off with a helper called Nathan, who just happens to be a professional breakdancer. The routines are excellent, fun, lively and well executed and certainly help to get the crowd on side, particularly the kids in the audience (it’s a PG rated show). It must be Monahan’s Iranian heritage that makes him such a good dancer- go to any club in Middlesbrough and you’ll see that Teessiders aren’t exactly known for their skill when it comes to throwing shapes. Before long we’re all standing up to try and get a better view of the stage and clapping along to the music. If this stand up comedy lark doesn’t pay off in the long term then he might get quite far on Britain’s Got Talent. Perhaps Diversity are looking for an Iranian member? The high octane dance sections and skilful audience banter don’t quite make up for a lack of solid material, but if you’re looking for an entertaining, energetic show that’s fun for adults but also suitable for children then it’s definitely worth taking a trip to Monahan Land.